Cook the rice in the pressure cooker and make sure that the rice is not sticky . The grains have to be separated from each other. Alternatively, the rice can be cooked in a pan with double the amount of water, till is tender. The excess water can be strained. Heat oil in a pan, add chopped onions and fry till the onions become light brown. Add ginger & garlic paste, turmeric powder, yogurt, red chilli powder and salt and cook till the oil starts separating from the masala. Add chopped tomatoes, briyani masala and boiled potatoes and cook over a low heat for 15 mins. 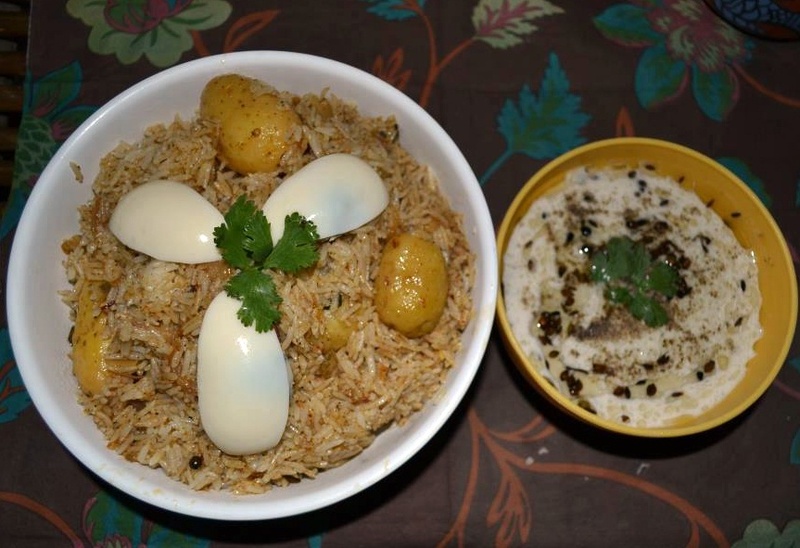 Now spread boiled rice into the mixture and stir well, garnish with boil eggs and serve hot with raita. This entry was posted in Rice, Vegetables by Kamakshi. Bookmark the permalink.